Welcome to the "PowerPoint Speak Easies Volume #3"
PowerPoint Speak Easies are a collection of 26 characters that are animated so that they give the effect that they are talking. 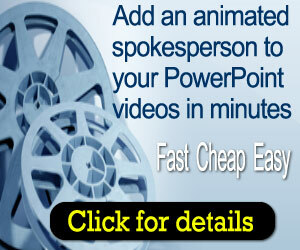 When added to a PowerPoint video with an audio voice over, they become "spokes people". Each of the 26 characters has 3 different poses and there's a wide variety of characters for users to choose from. Affiliate program handled through JV Zoo. PowerPoint Speak Easies Volume #1 - The original collection of Speak Easies talking characters. Animation Sensation - 7 high quality animated characters in a variety of poses and emotions. 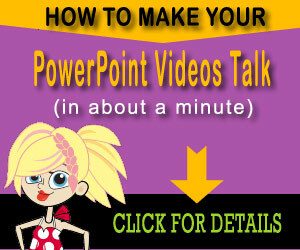 How to make PowerPoint videos talk to your audience. Got a minute? Make your videos talk! Battling the video making blues? Here's the cure. Wonder What It's Like to Be a Video Pro? As you probably already know, video marketing is hot. But before you can market using videos, you have to make videos. And they have to be good. Here's a fast and easy way to make your videos "talk". It's called PowerPoint Speak Easies and they are a collectiion of 26 "talking" characters. You just add your audio and a Speak Easies animatied character to a PowerPoint slide and in less than a minute you have your very own spokesperson talking to your viewers. There's 26 different high quality Speak Easies characters and each comes with 3 different poses. Speak Easies can be used to make all sorts of videos, such as explainer videos, Youtube affiliate review videos, video sales letters, email squeeze page videos and many, many more. They are truly an excellent way to make simple but cool videos. Check them out for yourself now, I really think you'll be impressed.